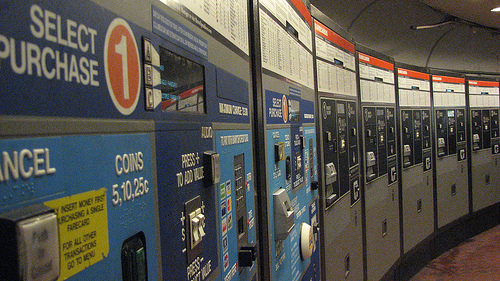 Metro fares in DC will increase to alleviate a $173 million budget shortfall. Photo by jcolman. Last Thursday, the Metro Board of Directors unanimously approved the biggest fare hike in the history of the transit agency, totaling nearly $109 million in rail, bus and paratransit fare increases. The deal was made over a “lunch break,” closed to the public. Metrorail fares are set to increase at the end of June. Rail riders who use paper fare cards will also pay as much as 25 cents more per trip than SmarTrip users, as a way to encourage the use of electronic pre-payment. These and other fare increases are intended to help close the $189 million budget gap for fiscal year 2011, which starts July 1. Meanwhile, Metro held a public hearing last night about the transit agency’s Capital Improvement Program budget for fiscal year 2011, which is expected to total $709.3 million. The complete list of projects includes things like replacing old buses and rail cars, increasing the capacity of bus garages, rehabilitating sections of the metro rail lines, upgrading power systems, fixing elevators and escalators, and improving bicycle and pedestrian facilities. WashCycle points out that the board plans to “cut the funding for bicycle and pedestrian improvements by 53.3% from $3 million to $1.4 million.” Ironically, this is happening at the same time as the Federal Transit Administration is developing cycle-friendly policies to allow grant funding for bicycle improvements near bus stops and rail stations. Erica Schlaikjer contributed to this post.